Remember those snorkels and pads astronauts used during the ammonia pump replacement on station this past December? The new measures went a long way to helping astronauts stay safe if another helmet water leak happens, but at the same time, NASA is eager to find the cause so they know how it happened and how to prevent it. Two maintenance spacewalks are planned for Expedition 40, but they’re not necessarily going forward yet. NASA has traced the issue to a fan pump separator, but there’s another issue, explained expedition commander Steve Swanson: where the particulates in the water came from. Perhaps they were from a filter, or perhaps from the water system itself. So NASA is reserving spacewalks on a need-only basis until more is known. “That was the problem. Now, we’ve got to find out where that came from,” Swanson said in a phone interview with Universe Today from Houston to preview Expedition 39/40’s mission, which launches in late March. Joining the two-time shuttle astronaut will be two other people, including Alexander Skvortsov. The Russian cosmonaut commanded Expedition 24 in 2010, which experienced a similar ammonia leak to the one that was just repaired a few months ago. While leaks and spacewalks are the items that grab headlines when it comes to spaceflight, one of the major goals of the International Space Station is more subtle. Researchers hope to understand how spaceflight affects the human body during long-duration missions. (This will be a major focus of a one-year mission to station in 2015.) 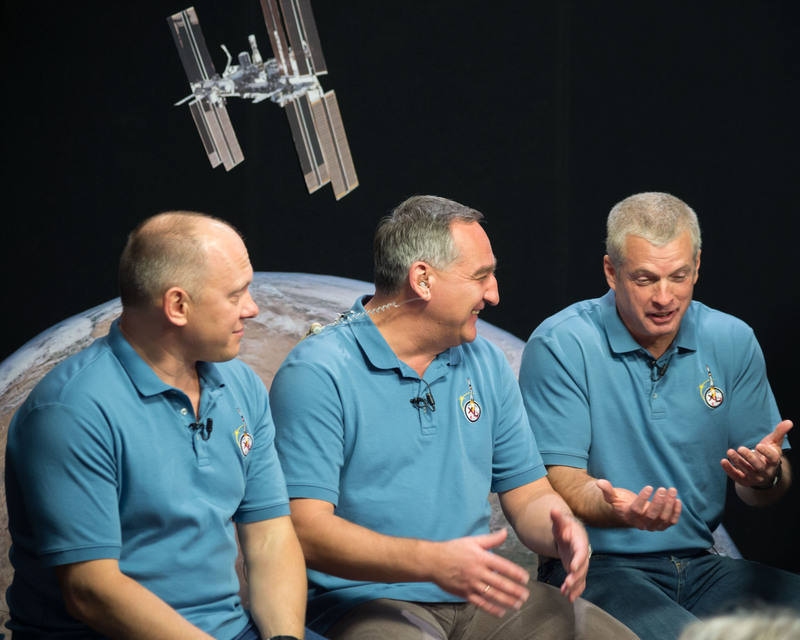 Through a translator, Skvortsov explained that the recent decision to extend station’s operations to at least 2024 will be a help for research of this kind. Rounding out the crew will be Oleg Artemyev, a first-time cosmonaut who has participated in precursor isolation experiments to the Mars 500 mission that saw a crew of people simulate a mission to Mars. Expedition 39 is expected to launch March 26, 2014 from the Baikonour Cosmodrome in Kazakhstan. The crew will join orbiting spacefarers Koichi Wakata (who will command Expedition 39, a first for Japan), Rick Mastracchio (who participated in the ammonia pump swap-out) and Mikhail Tyurin.